Nancy asked about the shape of the front pieces. You can kind of see the shape in the photo above - I am holding on to a straight edge, and there is an extra corner/angle along the front edge (it's kind of curling outward in the photo) in addition to the corner where the front edge & hem meet like on a traditional cardigan. When you tie the two top corners together, you can put it behind your neck and get that open, draped cardigan look. Kim wondered if the Lavender Label "Luxe" jersey might not hold a knot because it feels so slick. Very smart of you to think ahead like that, I didn't! But the good news is that the fabric does hold the knot. I wore this last Saturday evening, with a knot behind my neck (like the 2nd finished garment photo in my previous post and it held fine. I did notice, though, that the knot kind of slowly slid to one side of my neck, and I had to re-center it a couple of times. Meli88a asked if the long fronts get caught up around your legs when the cardigan is worn without wrapping. I'm not sure, I haven't tried it like that yet, but I can see how that would be really annoying if that were the case! A few people wondered how this would work with various body types. Keep your eyes peeled when you are out shopping and try one on if you see it. I do think that if you wear a shell/tank underneath that is the same color as the cardi (like in the Simplicity photo), it'll have more of a slimming effect than if the cardi, your shell/top, and pants are all different colors, like in my photos. Or, as in the DKNY video, the model's top and pants (leggings) are the same color, which also creates a slimming effect. After reading your post I decided to try and wear mine a different way today (I made the shorter version), I tied a knot and wore it the same way as your second photo - looks good, but like you I found the knot sliding round to the side. I hadn't stitched the collar to the inside to hide the elastic, but found that it rolls to the inside anyway. I tried to hide the knot inside the roll of the collar but it didnt' stay there. Looks like a wonderful piece to wear on an airplane. Always cold on board and never remember to grab a blanket (plus they look pretty silly pulled up to your neck). I often take a shawl, but this looks like it would really do the trick. What in the world is wrong with bloglines, it's not updating your blog for me - ugg! So here I am, a day late and a dollar short again. Love the cozy. Honestly I had never really entertained the thought of making one, but after seeing yours and Deepika wanting to do a sewalong, I think I'm going to have to take the plunge. It's so dang cold here sometimes, that half the year or better I feel like I need a cardigan on. I'm always on the lookout for something to add to my closet and this one looks so versatile. I really had never even paid attention to it in the pattern catalog before. It looks great on you. I wanted to make one as well, so I bought McCall 5241. But then I see BWOF has one in the Oct 09 issue (126 - wrap around jacket). That looks super easy - one square of fabric with two holes for the sleeves. Did you look at other versions as well? What do you like about this Simplicity one? 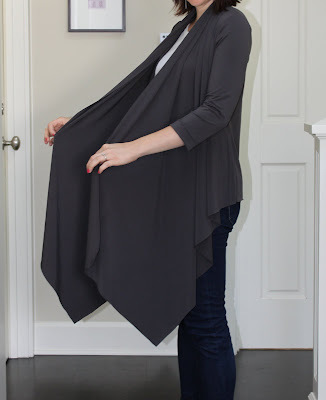 It amuses me how much time and effort I've spent trying to make a tailored garment--and, while close to my goal, that darned thing doesn't look 1/10th as elegant as this simple and drapey "cozy." I love yours! Hi Kennis - Yes, Burda had a similar cardigan in the July 2009 issue, but Sigrid offered some words of warning about it so I decided not to try that one. McCalls 5241 looks very similar to the Simplicity pattern, either one should get you the same end result!